Quality Equipment to Quality Customers for over 28 Years! 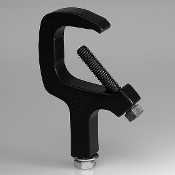 The Light Source "Mega Clamp"
The Mega-Clamp is the world’s new standard theatrical lighting C-Clamp. The Mega-Clamp is created from high tensile, aircraft grade, extruded aluminum, so it’s both stronger and lighter than cast iron clamps. Pattern holders allow patterns to be conveniently placed and held in the appropriate slot of a light fixture. Copyright © 1986-2019 Wild West Lighting. All rights reserved.